After the Easter egg hunt, there are always plenty of leftover hard-boiled eggs. Rather than making yet another egg salad, enjoy them in these spicy deviled eggs with homemade mayo. Deviled eggs tend to be a staple at big family events. For those that can stand some heat in the kitchen, we've added fresh chili peppers of your choice to the mix along with some ancho chili powder. 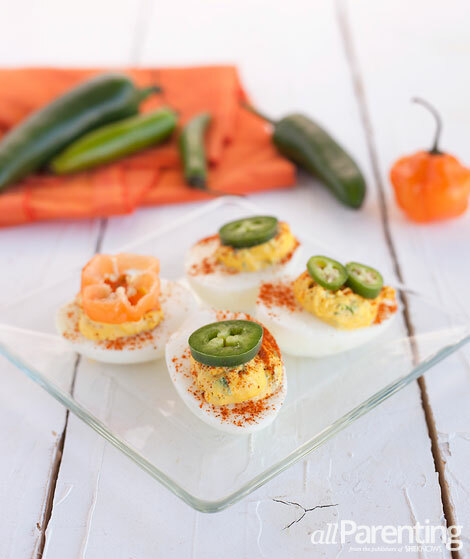 Combine that with homemade mayonnaise and these spicy deviled eggs will be a hot hit! Put the egg yolks and mustard in a food processor and turn on. Mix for a few seconds until combined. Very slowly, drizzle oil into the food processor while it is on. You should start to see the mayonnaise consistency form after adding about 1/3 of the oil. Continue to slowly drizzle the oil into the food processor until it is gone. Turn the food processor off. Add salt, pepper and lemon juice and turn the food processor on for another quick burst to mix. Transfer to a glass jar with a lid and refrigerate until ready to use. TIP^ It is very important that all of the ingredients are at room temperature and that the oil is drizzled in very slowly when making the mayo. 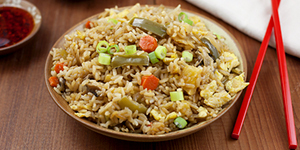 Cold ingredients or adding the oil too fast will cause the ingredients to not emulsify properly. Cut the hard-boiled eggs in half and scoop out the yolk into a small bowl. Mash with a fork. Add mayonnaise and mustard and stir well to combine. Add the finely diced chili peppers, stir to combine and season to taste with salt and pepper. Using a pastry bag (a Ziploc bag with the corner cut off would also work) filled with the egg mixture or a spoon, fill the egg halves with the mixture. Dust the filled egg halves with ancho chili powder, top with slices of peppers and enjoy!